With a heavy duty fleet of the best equipment available, J&M Towing is always ready to go anywhere at any time to recover your equipment. Our heavy duty trucks can handle anything from large buses to tractor trailers and dump trucks. Our wrecker is capable of safely and legally moving the even the heavies loads such as concrete mixers, and even a loaded trash truck. We really can do it all here at J&M Towing! 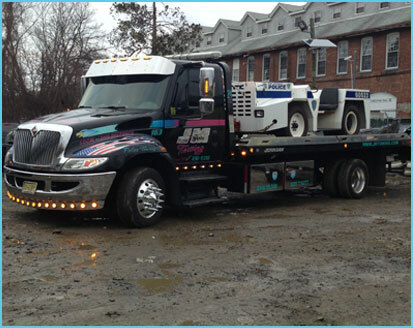 J&M Towing’s medium duty towing fleet is designed to handle a wide array of vehicles. 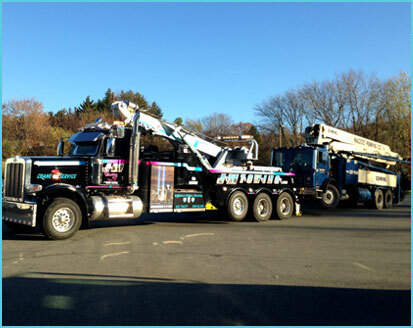 We can tow anything from business class box vans to bucket trucks and even small buses. Our team understands the need for your company vehicles to be professionally transported with the right equipment. When you call, we’ll be there for you! 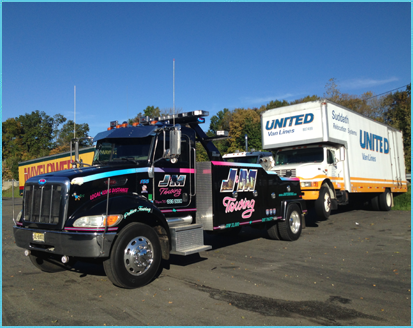 J&M Towing’s light duty towing fleet assist motorists daily on the highways and streets by providing a solution at the right time and place. As a leading towing company in New Jersey we have the experience and equipment to to assist you in any towing or accident recovery situation when you need us most. As you can see, J & M Towing is not your average towing company. Whether we are out during the holidays offering assistance to shoppers who with a dead battery or who may have locked themselves out of their vehicle at the mall or we are helping people get home safe from a night out on the town after a night of partying, we love what we do. Our team has always gotten thumbs up and positive feedback time and time again – which makes it well worth the time and effort to help out in our community.